As shown in the series above, oxidants are generally placed on the left-hand side of the table with the strongest oxidant at the top while reductants are on the right with the strongest reductant at the bottom. It is important to remember that redox reactions occur by reacting the strongest oxidant with the strongest reductant in a cell/system. To deduce the overall balanced equation of a redox reaction from the electrochemical series, you must ensure that both half equations being used has the same number of electrons. If not, multiply each to reach their lowest common multiple. Once multiplication has been applied, add the two half equations together and cancel out any reactants/products such as electrons. Electrons should never be in the overall balanced equation. (Note how the half equation involving Na has been multiplied by two so that electrons in both equations would be able to cancel each other out). Eº is also known as the standard half-cell potential and it indicates the tendency for a reaction listed on the electrochemical series to undergo a reduction reaction. 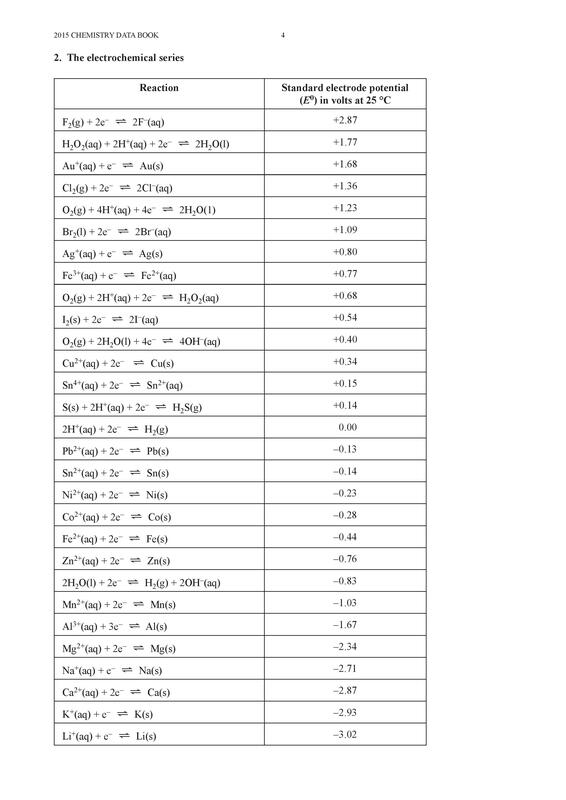 The higher the Eº value, the more likely the reduction reaction will occur. The lower the Eº value, the more likely that instead of reduction, the oxidation will occur. Eº value of a reaction is derived from comparing the reaction to a hydrogen half-cell; whether the reaction will undergo a reduction or oxidation reaction when connected to it. Hence, the reduction of hydrogen ions has an Eº value of 0. The potential difference of a cell measures the amount of energy that flows between two half-cells. Potential differences are measured using voltmeters that are part of the external circuit. Reactions that are further away from each other on the electrochemical series, have a larger potential difference are observed to be more spontaneous. As mentioned, the electrochemical series is used to predict the reactivity of oxidants/reductants under certain conditions. 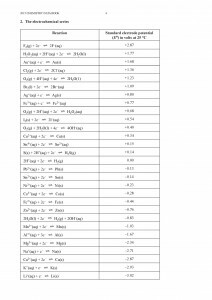 If any of these conditions are not met, the electrochemical series cannot be used to pick the preferential reactivity of compounds. It can still be used as a rough guideline to estimate the relative reactivity if the conditions do not deviate too much. The electrochemical series also has the limitation of not being able to tell us the rate of reaction of half equations. Just because a reaction is predicted to occur before another does not mean it will react at all. The reaction of hydrogen peroxide with itself can be predicted to be a viable reaction as it appears as an oxidant and also a reductant at a lower position in the electrochemical series. However, the rate of its reaction is so slow that no reaction is observed unless a catalyst is used in conjunction.